Radial shock wave therapy is a highly efficient, non-surgical treatment for acute and chronic pain in the muscles and tendons. Radial Shock Waves Therpay uses high-energy sound waves. Previously in the 80′s the machine was used by physicians to disintegrate kidney stones. It is more recently been discovered that its powers extend in to treatment of chronic musculoskeletal pain. The shock wave creates a strong stimulus or irritation to painful body regions and in doing so promotes and speeds healing. The healing process is increased by creating a stimulus or irritation to the tissue. The shock waves irritation create new vessel blood formation or “neovascularization” to the damaged area. This influences an increase in blood circulation and metabolism, where damaged tissue will regenerate and heal. There are very few risks or side effects. Slight bruising and tenderness are the two most reported. The treatment is however contraindicated in areas where there has been a recent Corticosteroid injection or if the patient is on heavy blood thinning prescription (Heparin etc.). Aspirin is OK. Occasionally patients may experience some minor discomfort, which may last 24-48 hours. The benefit is normally experienced after usually only 3 treatments over the span of 2 weeks. It is common to have immediate relief after the treatment, however it can also take up to 4 weeks for pain relief to begin and between 9 to 12 weeks to see complete results. Studies demonstrate the most significant healing is between 6 and 9 weeks. This therapy is shown to have a 80-90 % success rate in treating chronic tendonitis conditions. Locate the area of pain or discomfort. Gel is applied and the head of the applicator is moved in a circular motion over the pain region for the duration of the treatment. Treatment is done over 15 days for most commonly a combined 3 total treatments (This frequency of treatment is what the research shows to work most effectively). 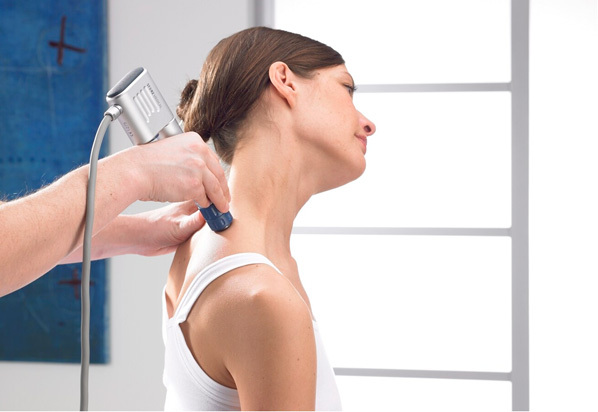 Why Consider Radial Shockwave Therapy?